The Northern Mockingbird (Mimus polyglottos) is an slim gray bird with flashy white wing patches and white edges on its long tail. It is one of the most vocal and distinctive common, backyard birds in America. Its scientific name is more felicitous than its common name: the bird mimics perfectly the sounds of many other birds (and inanimate objects), and it is associated with the American south, where it had its roots. 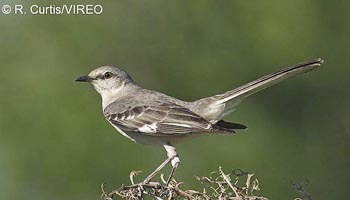 This species is "northern" only by comparison to the Tropical Mockingbird of the Yucatan Peninsula and further south. The Northern Mockingbird has benefited from human impacts on the landscape: the creation of hedgerows, parks, orchards and grassy open spaces. The bird's range expanded during the twentieth century and now includes the entire continental U.S. and a narrow margin across the Canadian border. The Northern Mockingbird repeats each mimicked phrase several times and, without pausing, shifts to another repeated song or sound; a bird's repertoire may include 100-200 different phrases, and the outpouring may continue well into the night, to the consternation of any homeowner whose chimney happens to be the mockingbird's stage. The Northern Mockingbird is a permanent resident across the entire continental U.S., a narrow margin running along the Canadian border, Cuba and Mexico south to Oaxaca. The Tropical Mockingbird of the Yucatan Peninsula and further south lacks the white wing patches and has white tips on the tail feathers. The Bahama Mockingbird is similar to a thrasher; it is a heavier bird with streaked flanks and brownish upperparts, and its song phrases are shorter. The Loggerhead Shrike has black wings, a black mask and a heavier hooked beak. The Northern Mockingbird spends much of the time like an American Robin foraging on lawns and close-cropped areas. It prefers parks, suburbs, orchards and farms, and it nests in shrubs and trees and on buildings. The Northern Mockingbird eats insects, fruits and an occasional lizard. Both females and males sing, which is unusual among birds, and adults continue to learn new phrases later in life. According to Alexander Wilson, in the 1820's so many mockingbirds had been captured by merchants and sold as caged birds for their singing prowess that the species was almost eliminated from Philadelphia.